Barber Quarter coins, minted from 1892 to 1916 are available today mainly in low grades. The three outstanding dates are 1896-S, 1913-S, and the very rare 1901-S. 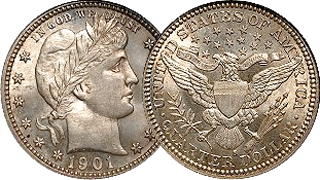 The 1901-S and 1913-S are two of the three lowest mintage dates of 20th century minor U.S. coins, with about 72,000 and 40,000 minted, respectively. Note: Posted prices are for REFERENCE ONLY. Exact prices depend on dates, condition and current market. Better dates pay more.